As we approach the election, it’s a good time to take stock of the progress we’ve made over this Parliament. In Civil Service Group, we have worked with thousands of people across all departments to make the changes identified in the Civil Service Reform Plan. The Plan sets out a diverse range of programmes aimed at making the Civil Service more skilled, less bureaucratic, and more unified. With such a varied range of reforms that affect more than 400,000 civil servants and through them everyone in the UK, we have used some key measures to indicate the impact we have had. 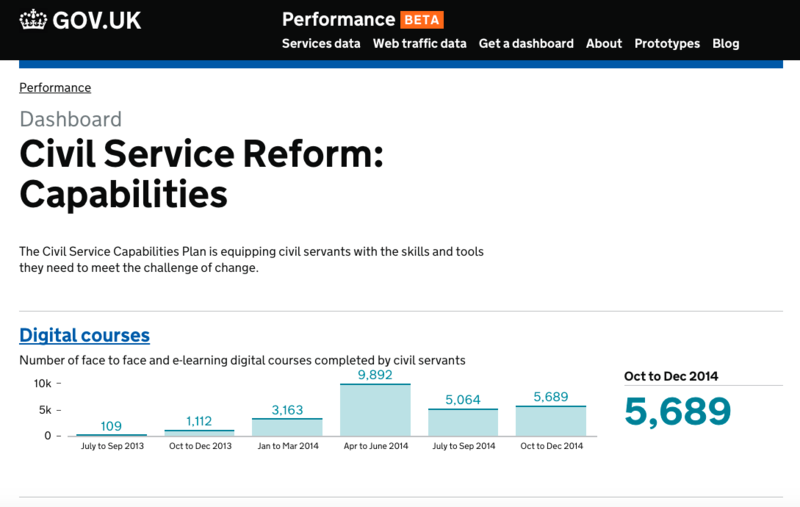 Through creating and publishing dashboards on GOV.UK, with the help of the GDS Performance Platform, we are able to share that progress so that people can see some of what the Civil Service has achieved over the past few years. An increase in skills is a hard thing to measure, but one of the aims of the Reform Plan was to create more of a learning culture within the Civil Service and to focus on the four priorities identified in the Capabilities Plan: digital, commercial, projects and programme management, and leading and managing change. We believe that higher numbers of civil servants completing learning and development in priority areas indicates a positive change in behaviour which will lead to a more skilled Civil Service. Our Capabilities dashboard shows increases in learning and development in the majority of these areas. We have reduced bureaucracy by transforming the way the public interacts with government, reforming transactional services to make them easier to use and saving money in the process. The impact is millions more transactions carried out online, reducing cost per transaction by 25%, and generating £210m savings for the taxpayer. See the Civil Service Reform: Digital dashboard. We have also improved by providing challenge, oversight and assurance of the Government’s major projects through the Major Projects Authority, saving £3.3bn by 2013/14. See the Civil Service Reform: Major projects dashboard. And The Way We Work Programme has delivered new ways of working for staff, empowering them with new technology and workspaces, enabling them to work flexibly and cost effectively and maximising productivity. This has contributed to a reduction in the size of the Government estate, generating savings of £625m. See the Property and Land dashboard. The Functional Leadership Programme is integrating corporate functions, such as HR, communication and commercial services, to deliver efficiency savings and higher quality, more resilient support for Government. For example, we have reduced the cost of Government communications from £885m in 2009/10 to £413m in 2013/14. You can read more here.